At 12.40 p.m. on 13 November 1896, Te Maari, a crater at the northern end of the Tongariro range, erupted spectacularly. It continued to erupt sporadically for nearly a year. An eruption in 1868 had formed the crater, which was named for a Māori woman of high rank who died around that time. This crater may have first erupted in November 1892, when it reportedly ejected water, sand, small stones and pumice. There was activity in other outlets in the Tongariro range, including Ngāuruhoe, Tongariro’s main active vent. Te Maari’s first 1896 eruption turned the small steam vent into a large crater 100 m long and 150 m wide. It lasted for about 40 minutes, emitting steam and smoke to a great height. Fine weather allowed onlookers to see the plume from some distance away. A south-westerly wind carried a cloud of red ash towards Ātiamuri, north of Taupō. 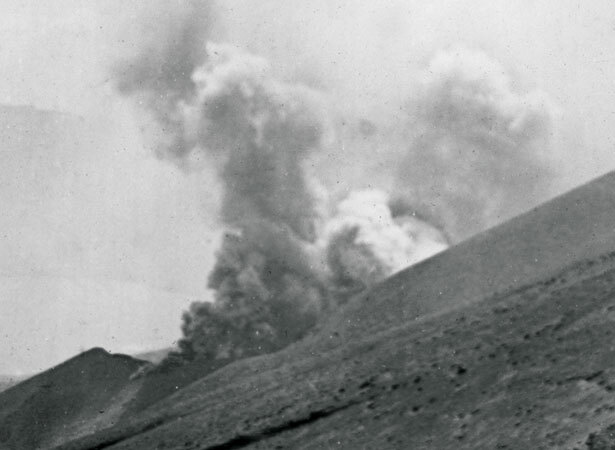 A party on the slopes of Tongariro made a hasty retreat. The residents of Otukou, a Māori settlement immediately beneath the crater, also evacuated the area. We have 1 biography, related to Mount Tongariro erupts.